​Recently, a couple piano teachers have asked for advice about handling dinner time. I need to teach through the dinner hour and my family is upset. They just aren't supportive of me right now. What do I do? If you're in this situation, know that you're not alone! It's a struggle for EVERY family, but yes - probably more so for us piano teachers. After all, dinner time is an ideal teaching hour since most of our students aren't available until later in the day. But good news! You CAN make family dinners a reality in your house. I'm not saying it'll be easy, but it can be done and you won't regret it. My husband works odd hours and yet I make dinner time a priority for our family. Looking back, I can honestly say that I've always put our family before piano. I've taught before dinner and after dinner, but not during dinner. Did I always cook fancy meals? Absolutely not. Many nights I served sandwiches, but we enjoyed those sandwiches TOGETHER and that's what matters. You can do it too! Even the busiest teacher can schedule a 30 minute break. Making this a priority will mean the world to your family! 2. don't think all or nothing. Your family probably has various activities at night. If that's the case, start small. Set aside just 2 or 3 weeknights for meals together. If you're not having ANY meals together right now, even adding just 1 meal is a step in the right direction. That's enough to show your family that they are your priority. Plan something and then work the plan. Let's say you decide to have family meals on Tuesdays and Thursdays. Keep those meals the same every week. Think "Taco Tuesday" and "Thursday Casserole." Or maybe you come up with a couple of easy meals that you alternate from week to week. Don't feel pressure to cook a full meal. The point is not the food, but the time together. Maybe your husband can cook something or even your kids? ​Whatever you decide - DECIDE SOMETHING! If you ignore family meals, that right there is a decision. Be intentional with your family life and make that a priority. Tell me how dinners work in YOUR family. I'd love to hear! Do you need practical help setting up your day? Just a couple summers ago, I was struggling to keep my head above water. We had just moved to a new city and it was all kind of overwhelming. But I decided to do something about it by being more intentional with my mornings. ​​The Make Over Your Morning Course made a huge difference in my life. Shortly after I finished that course, I was so motivated and encouraged that I created Upbeat Piano Teachers. It completely changed the direction of my life! What is Make Over Your Mornings? 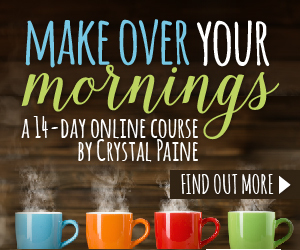 It’s a 14-day online course that includes videos, a workbook, and step-by-step projects designed to help you maximize your mornings. You’ll experience more success in your business, more order in your home, and more joy in your life.